Blacklegged (deer) ticks. Top row: adult male and female. We are in full summer mode, so we are commonly hiking, camping, and doing other outdoor activities that puts us close to where ticks live. Blacklegged ticks are most common in the underbrush of hardwood forests and in fields. Although Lyme disease can occur in many areas of Minnesota, it is most common in the east central, north central and southeast areas of the state. If you are going to be out in a known tick habitat, take precautions to protect yourself from blacklegged ticks. * Stay on trails and when possible avoid walking into brushy, grassy areas where ticks are more common. * Wear long, light colored pants so ticks are easier to detect. For additional protection, tuck your pants into your socks. * Use repellents to help keep the ticks off of you: Use Deet on clothes and skin but apply products containing permethrin just to clothing. * Do a tick check when you return from the outdoors. They are small and can be easily overlooked so look carefully! Be sure to look in out of the way places, like behind ears or behind knees. If you do find a tick, especially if it has been biting, get it positively identified. While blacklegged (deer) ticks can transmit Lyme and other diseases, American dog ticks are not an important disease vectors. 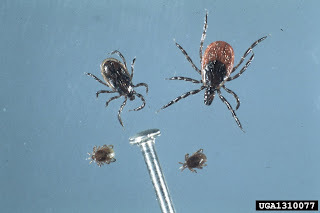 Remember that a blacklegged tick needs to be biting to be able to transmit disease. In fact, it needs to be attached for 24 – 48 hours before it can transmit Lyme disease (the amount time varies for other diseases). Even if you are bitten, not every tick is infected with disease. 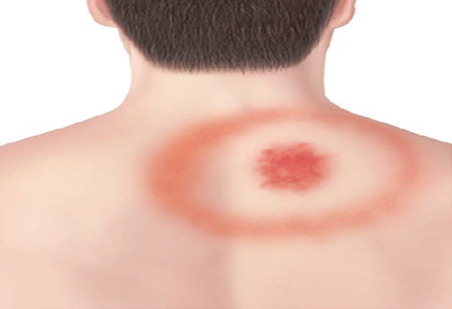 One of the most common symptoms of Lyme disease is a red bulls-eye rash. This occurs in 70-80% of cases. This rash is usually seen 3-30 days after a tick bite. People with Lyme disease may also initially experience fever, headache, and muscle aches. If you believe you may have Lyme disease, see a physician. When caught early, Lyme disease can be successfully treated with antibiotics. For more information, see Ticks and their control and Tick-borne diseases in Minnesota.